This evening we had burgers and fries for dinner! I did remember to take a picture to share. 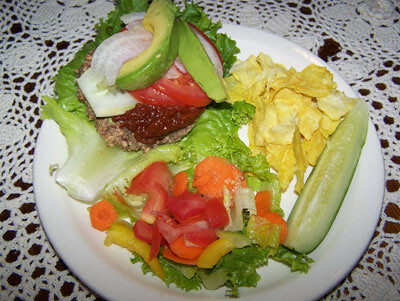 Burger on lettuce with ketchup, onion, tomato, cucumber, and avocado that was eventually topped with another lettuce leaf "bun"...served with a side of chips, salad, and "pickle"
The burger is based on a recipe by Matt Amsden in his book, RAWvolution (my favorite raw food prep book). The chips were just created by KDcat and they are amazing! I was never a big chip eater, but now I can't get enough of them. YUM! Here's a sweet treat I made for KDcat earlier this morning, too. 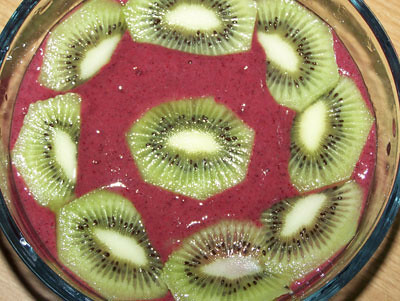 It's a base of fresh oranges, frozen mixed berries, bananas, hemp protein powder, little bit of agave, and served with sliced kiwi. She loved it. We're finishing up a huge project here at Pure Jeevan and we can't wait to share it with all of you! We're looking for some readers to help us out a bit, if you have a few free minutes. It won't require more time than you feel like giving ,and your help will be appreciated so very much. I can't tell you more about it right now, other than it's web-based and a bit of fun. So, send me an email to let me know if you might want to help us out a bit. We'll fill you in on the details the closer we get to the finished project. Trust me, you are going to think it's a cool thing we're working on that you'll possibly be helping out with, as well, even if it's just a few minutes here and there! So, send me an email if you're up for helping (WendiDee? @? PureJeevan? . com). Thanks and lots of love to all of you! Major dejavu in reading this post...or should I say jeevanvu? lol sign me up! Can't wait! I might be able to help, need more details. i love the food pic... and want to sample the yumminess firsthand! but why was "pickle" in quotes ?? I just emailed you Wendi Dee! The food looks super good! The sweet potato chips were AMAZINGLY delicious and crispy! YUM! p.s. For anyone who offered to help, I need email addresses if I don't already have them for you. Thanks, again!! Thanks so much for letting me know!!! I'll stop by Whole Foods to check out if they have them! It will be a nice treat ever once in a while!